Beauty Shout Box: HOW WOULD YOU HANDLE THESE THREE SITUATIONS? to be a great friend and confidante of Oprah Winfrey. A Rainy Day : I don't mind a rainy day or two, but not constant rain.Last year on a trip to the UK it rained constantly for the two weeks that I was there and to be honest....it was miserable! 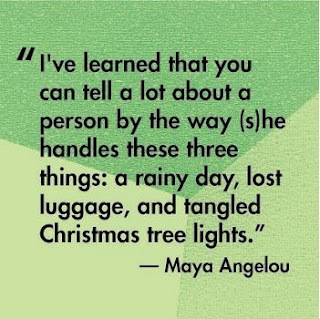 Lost Luggage : I don't want to tempt fate or anything, but thankfully with all my work and holiday travels in the past, I have never had to contend with a lost luggage situation. How would I react?...initially I would freak out, but always looking on the positive side I would hope that the airports tracking system would soon re route my luggage to its correct destination. However I have had my luggage broken into on a trip from Johannesburg to Durban, yet nothing was taken even though my suitcase had all my expensive fragrance,skincare and perfume in. Tangled Christmas Tree Lights : Every year, for one evening in mid December I can guarantee that the air in my lounge will be "blue". Yes! you've guessed it...it's the annual ritual of putting up the family Christmas tree. These tangled fairy lights drive me absolutely insane, as no matter how much care I take to pack them away "untangled" they have a knack of "tangling" themselves again. It happens every year without fail. Over the years I have sat literally for hours determined not to be beaten by the "fairy light " challenge. I gave up the fight several years ago and I am positive the majority of fairy light sales stem from frustrations of people, who give up and throw away perfectly good working lights. My other theory is....the manufactures use self twisting wires that set to work on the 6th January and by the time Christmas arrives your beautiful twinkly Christmas tree lights are well and truly deemed as "useless". The joys of Christmas...roll on December. I am not sure what Maya would learn about me after reading my three responses!